At least 33 people, including a local army chief, have died and 46 have been injured in a suicide attack on the western edge of Baghdad, officials say. The attack took place in the Abu Ghraib municipality, and appeared to target a group of dignitaries as they left a national reconciliation conference. Violence levels have declined in Iraq recently, but this is the third major attack in the last few days. More than 30 died in an attack on a police recruitment centre on Sunday. On Thursday, a car bomb exploded at a cattle market in Babel province killing 10. The BBC's Mike Sergeant in Baghdad says it is too soon to say whether the attacks constitute a pattern but they show that life in Iraq is still dangerous. But he says that if the violence of recent days continues, a timetable announced by US President Barack Obama to withdraw most combat troops by mid-2010 could be increasingly hard to maintain. The bomb exploded as delegates came out of the conference, attended by a large number of VIPs. The hall which hosted the conference is about 25km (15 miles) from the centre of Baghdad, and close to the Abu Ghraib prison facility, which came under scrutiny because of the abuse of prisoners by US troops. 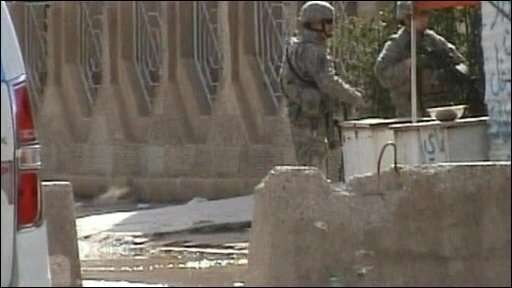 One witness, the owner of a car repair shop, described how the bomb went off as the delegates began a walking tour of Abu Ghraib's market. "I hid for a while, but then I raised my head to see scattered bodies, including women and children, and some surviving women and children were screaming out of fear," Ahmed Ali, 33, told the Associated Press. Police sources said tribal leaders, police, soldiers and journalists were among the dead in the latest attack. Two journalists for the Cairo-based independent TV station al-Baghdadiya were among the dead, and four al-Iraqiya journalists were wounded, reports said. Al-Bagdadiya correspondent Suhaib Adnan and cameraman Haider Hashim were both killed, a station spokesman said. An Iraqi government spokesman, Ali al-Dabbagh, insisted after the bombing that there would be "no going back" from the path of reconciliation in Iraq. "Reconciliation is the response to the devilish acts that try to wreck nationalist efforts between Iraqis," he told Reuters. The latest attack comes days after the US military said it was to reduce troop numbers in the country by 12,000 in the next six months. Maj Gen David Perkins, a spokesman for US forces in Iraq, told a news conference on Sunday that violence was at its lowest level since the summer of 2003. He was also reported as saying the recent series of attacks was evidence that terror groups such as al-Qaeda in Iraq were growing desperate as they sought to derail security gains in the country. Iraq has massively expanded its police and military forces over recent years as Mr Maliki's government seeks to ensure local forces can provide security amid the envisaged draw-down. About 140,000 US soldiers are currently in the country. The withdrawal is part of President Barack Obama's plan to end the "combat mission" in Iraq by August 2010, entailing the withdrawal of some two-thirds of the US force there - some of which will be deployed in Afghanistan instead. Between 35,000 and 50,000 American troops will then stay in Iraq for a further year, to provide support and training to Iraqi forces, the US says.